Note: When the evaluation period was over, you’ll get a popup or notification, conveying message ‘Trial expired, You are no longer protected because Malwarebytes Anti-Malware free Trial has expired’, you’ll be presented with options to ‘End Trial’ and ‘Buy Premium’. That’s pretty annoying especially as Malware Bytes is a real anti-spyware diamond software that worths to be ran every now and then to keep your PC protected from ever increasing terrible spyware malware and ransomeware. Thanksfully it is rather easy to fix that and revert back to Malwarebytes Free Trial. 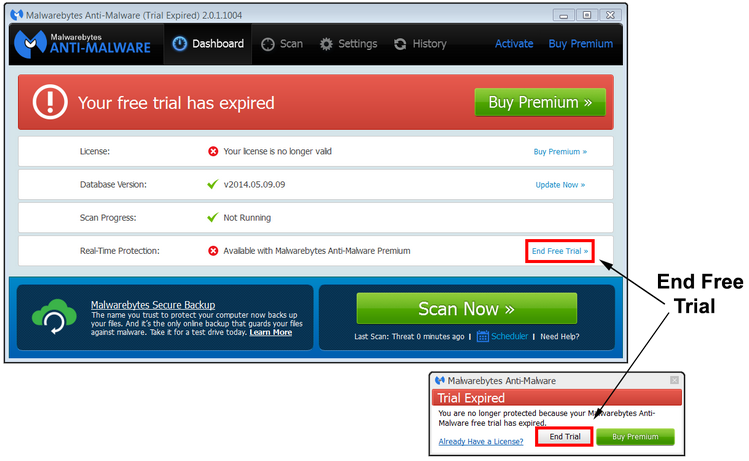 Open Malwarebytes, and on the Dashboard, click on ‘Malwarebytess or End Free Trial’, the message here does vary according to the version you have. Then will be instantly converted to the free version.